Courtesy Allen Superior Court formally unveiled its renovated Courtroom 107 last week during the Judicial Conference of Indiana fall meeting. A cramped Allen County courtroom equipped with outdated technology and an awkward layout has more than doubled its size and now boasts the latest in judicial design and technology while maintaining the historic integrity of a century-old building. 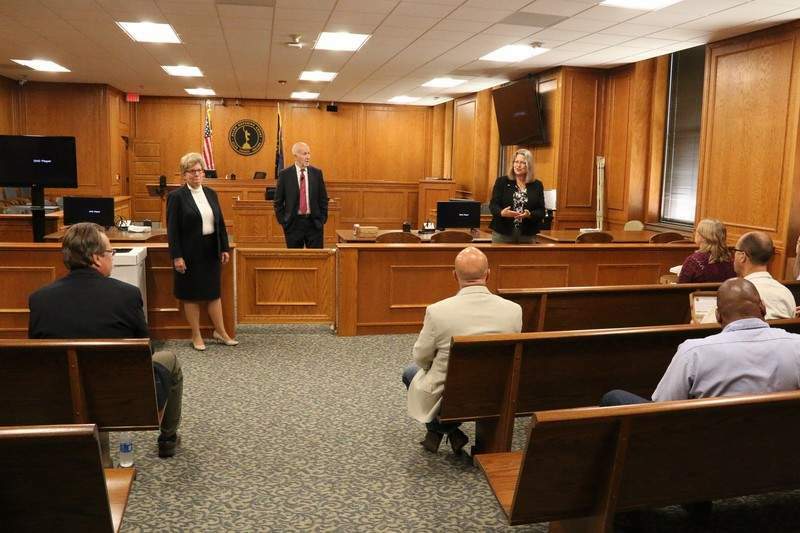 Allen Superior Court formally unveiled the renovated Courtroom 107 last week during the Judicial Conference of Indiana fall meeting, according to a news release. The nearly 2,000-square-foot courtroom features twice the amount of spectator seating and a jury box with 12 seats instead of the previous six, the release said. The room also is fully compatible with the Americans with Disabilities Act access guidelines. The Courthouse Preservation Trust relocated and the Allen County Law Library gave up much of its space as part of the project, the release said. The first-floor courtroom was last updated in the early 1990s and is primarily used by civil judges whose cases need modern audio and video equipment, ample jury and spectator areas and access for the disabled, the release said. Bloom has long been the commissioners' point person on courthouse operations and partnered with Judges Gull, Stanley Levine and Nancy Eshcoff Boyer on the project, the release said. Crews from Allen County Buildings and Grounds worked three shifts a day to complete the upgrades, and Ed Welling of Grinsfelder Associates Architects provided input, the release said.